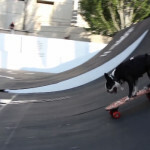 In the month of May 2016, Boston Terrier dogs named Tuxedo, Mia and Guizmo were skateboarding and scootering at an International Extreme Sports Festival (FISE). They performed on May 4th in Montpellier’s downtown. Montpellier is a city from the south of France, Europe. 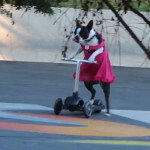 FISE 2016 is an event which is featuring extreme sports like BMX, Roller, Mountain Bike, Wakeboard, Scooter and Skateboard.